Nathan Yau, on his site Flowing Data, posted this great interactive graph to help visualize the CDC’s Underlying Cause of Death data. Below is just a static graph, but if you click it, you’ll end up on his interactive graph which changes as you select those categories along the top row or the causes of death in the body. Do you see anything? There’s a lot of data represented here. One thing I noticed, we’re much less likely to die of cancer as we age. Look at that downward slope! That could be, as Yau suggests, that it’s not that we get cancer any less as we age, but that something else kills us before the cancer does. Many of the common cancers show declining acceleration with age: cancer incidence rises with age, but the rise occurs more slowly in later years. 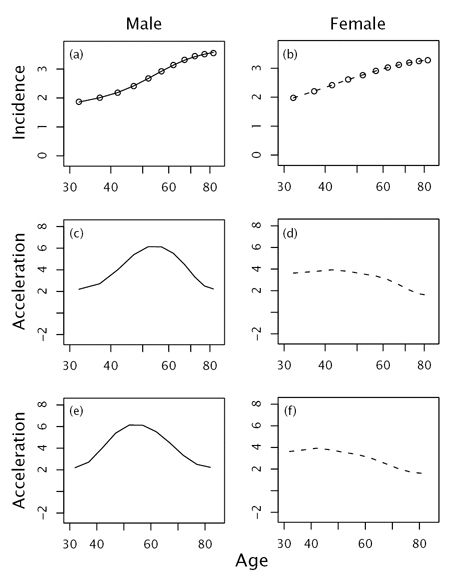 The age-specific acceleration for males in Figure 2.1e shows that cancer incidence accelerates at an increasing rate up to about age 50; after 50, when most cancers occur, the acceleration declines nearly linearly. The acceleration plot for females in Figure 2.1f also shows a linear decline, starting at an earlier age and declining more slowly than for males. Age-associated changes in the organism may contribute not only to the rise, but also to the deceleration and the decline in cancer risk at old ages. As we age, there are forces that act both in favor of cancer development, and against it. Forces that act in favor of it include greater exposure to harmful substances, a weaker immune response, chronic inflammation, and a slowing of DNA repair activity. Forces that act against cancer development include a slowing down of cell division and a slower metabolism (both can operate pro and con though). Old cells that don’t divide much anymore also don’t become cancerous that much: “Non-proliferating cells have low or no probability of malignant transformation.” The net of those pro and con forces, for some people, can favor the suppression of cancer. The trick is to keep cancer cells from growing without harming or in any way compromising healthy cells. Restricting animal protein does that. It lessens levels of growth hormones and limits available amino acids. These two effects of a vegan diet (among others such as lessening inflammation), have been shown to slow cancer growth without interfering with necessary processes or harming healthy tissue. This may be one reason vegetarians live longer and enjoy lower rates of cancer. If you want to keep eating a lot of meat and dairy, don’t say I didn’t warn you. This entry was posted in Uncategorized on January 19, 2016 by Bix. Let us hope that Biden’s cancer moonshot explores the effect of vegan diets. How could I forget. Thank you, Bill, for Yau’s graph!